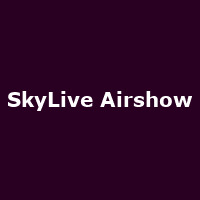 Established in 2015, SkyLive was the first Teesside airshow in 25 years. "featuring air displays, on-the-ground fun, classic cars and live music. Skylive have partnered with Durham Tees Valley Airport to bring back the Tees Valley Airshow to the region, last held in 1989, as dozens of planes, helicopters and classic cars set to thunder into the North East on August Bank Holiday weekend!"